If tax policy was a religion, the Holy Trinity of reform would be very straightforward. Lower tax rates in order to encourage more productive behavior. Get rid of double taxation in order to enable saving and investment. End distorting preferences in order to reduce economically irrational decisions. But if tax policy was a meal, the first two items would be the dessert and the last item would be the vegetable. Simply stated, politicians like lowering tax rates and reducing double taxation because that makes most people happy (at least the ones who actually pay tax). But when you take away loopholes, the people who benefit from those preferences are unhappy. And they get very noisy. Interest groups hire lobbyists. Trade associations spring into action. Campaign contribution get dispensed. If tax policy was a movie, it would be Revenge of the Swamp Creatures. In this clip from a recent interview, I talk about some of the dessert, specifically a much-needed reduction in the corporate tax rate. Bu today I want to focus more on the vegetables of itemized deductions. Here’s some of what Reuters reported last month about the swamp gearing up to protect its privileges. …industry groups and other sectors of society are gearing up to fight proposed changes to the personal income tax. …proposed changes to the personal tax code have already stirred opposition from realtors, home builders, mortgage lenders and charities. And here’s a description of what might happen and the impact. To simplify the tax code, Republicans have proposed eliminating nearly all tax write-offs including those for state and local taxes, then doubling the standard deduction. This would eliminate the incentive to itemize and should drastically reduce the number of taxpayers who do so. Currently, many taxpayers use itemized deductions, claiming write-offs for things like charitable contributions, interest paid on a mortgage and state and local taxes. If the standard deduction becomes larger, fewer taxpayers will need to itemize, reducing the incentive to hold a mortgage or contribute to charity. …Estimates suggest more than half of taxpayers would stop itemizing under the proposed plan. Should we hope that these reforms occurs? If people lose or forego itemized deductions, would that be a good outcome? As a long-time fan of the flat tax, I’m obviously not a fan of these preferences. Though I always stress that I only want to get rid of loopholes if the money is used to finance lower tax rates. At the risk of stating the obvious, I don’t want the money being used to finance bigger government. Let’s see what others have said, starting with Justin Fox’s column for Bloomberg. He’s not happy that loopholes disproportionately benefits taxpayers with above-average incomes. Let’s talk about upper-middle-class entitlements, the subsidies that flow almost entirely to those in the upper fifth or even tenth of the income distribution. …Why do these subsidies continue…? Mainly, it seems, because they’ve been granted to a sizable, influential population who, it is feared, will fight any effort to take them away. There are other interested parties, too — the real estate industry and mortgage lenders in the case of the mortgage interest deduction… But mainly it’s the millions of upper-middle-class Americans who, like me and my family, are beneficiaries of tax subsidies. He’s right. I’m more upset about the economic distortions these preference create, but there’s no doubt that upper-income taxpayers reap most of the benefits. Here’s his conclusion, which I think is spot on. …if these tax breaks had never become law, no one would really miss them. Houses might cost a bit less. College might be slightly cheaper. Income tax rates might be a little lower. The economy might run a little bit more smoothly. So … how do we get to that place from here? By the way, Fox includes a chart showing how richer taxpayers get more benefit from the mortgage interest deduction. That’s certainly true, and I’ve previously shared data showing how the middle class gets almost nothing from itemized deductions compared to high-income taxpayers. Let’s focus specifically on those goodies for the rich. This chart from the Tax Foundation reveals that the state and local tax break is especially lucrative. 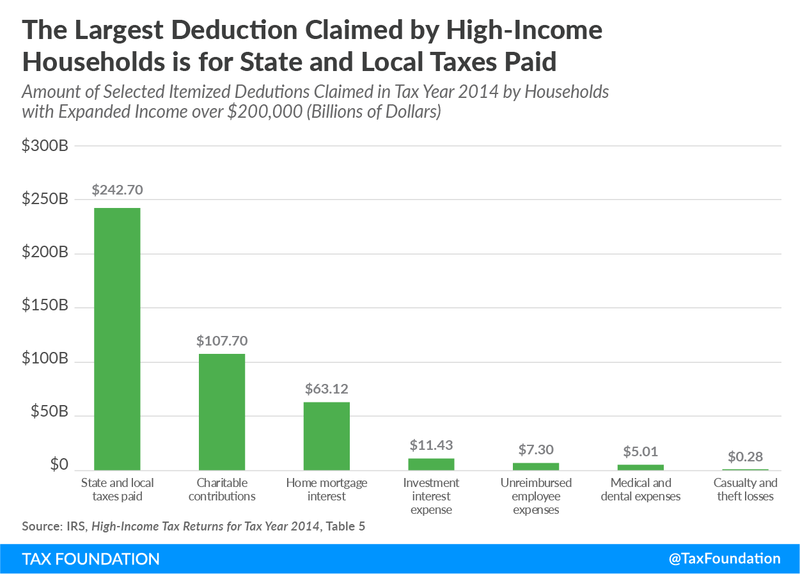 For what it’s worth, the state and local deduction is my least favorite, so I’d like to see this chart change. Though the healthcare exclusion may do even more economic damage (I assume it’s not included in the above chart since it’s an exclusion rather than a deduction). But the bottom line of today’s column is that we’re not going to get the dessert of lower tax rates unless policy makers are willing to eat some vegetables – i.e., get rid of some tax preferences. Or, to be more exact, it will be impossible, given congressional budget rules, to have any sort of meaningful permanent reforms of the tax system unless there are revenue raisers to offset the tax cuts. P.S. In any discussion of tax preferences, it’s important to properly define a loophole. Folks on the right generally think income should be taxed only one time (technically, they favor “consumption-base” taxation). So a loophole is a provision that results in zero tax on a particular activity. Folks on the left generally think the tax code should impose double taxation (technically, they favor “Haig-Simons” taxation). So they have a much bigger list of loopholes, mostly focused on provisions that limit the extra layers of tax imposed on income that is saved and invested. You see this approach from the Joint Committee on Taxation. You see it from the Government Accountability Office. You see it from the Congressional Budget Office. Heck, you even see Republicans mistakenly use this benchmark. By the way, Justin Fox presumably is in the Haig-Simons camp since his column treats the capital gains tax and 401(k)s as loopholes. But he cited one of my columns, so I can’t bring myself to criticize him. P.P.S. It (almost) goes without saying that many folks on the left want to curtail tax breaks. They openly argue that it is good to divert a larger share of income into the hands of politicians and in order to facilitate bigger government. Some of them are even honest enough (crazy enough?) to openly assert that all income belongs to the government. You have stated that the tax code has redistributed wealth from the poor to the rich, so you should be able to explain HOW this happens. You still have not. You list Buffett as your example, so let’s go with that. I assume this must mean you think that ultra-wealthy people don’t pay enough tax, and that taxes on investment income should be higher. The fact that Buffett is wealthy and pays low taxes does not mean that the tax code redistributed money from poor people to Buffett. It means that Buffett kept more of the income he earned from shrewd investing and increased sales of Geico insurance and See’s candy. Buffet does NOT take money from poor people via the tax code (they do take some from him). He DOES accept money from customers who willingly exchange their money in return for his products. Do you understand the difference between wealth created in the marketplace and wealth transferred via the tax code? Anyway, there are some problems with higher taxation of investment income. First, based on your comments, your concern must be the ultra-wealthy. The top 1% pay an effective tax rate far higher than the other income groups, and it’s only a relative handful of ultra-wealthy people that have sufficient wealth to generate such concerns. My point? It seems kind of short-sighted or narrow-minded to base broad macroeconomic policies on a relatively tiny handful of people. Second, there are very good reasons to tax investment income at lower rates, or not at all. A) Investment is key to innovation and productivity, and therefore prosperity, so it’s good for society to tax it as lightly as possible. B) Capital gains taxes treat inflationary gains as real, so a lower rate is appropriate. C) Taxes on investment income is double-taxation, so a lower rate is appropriate. It makes little sense to throw out these good reasons just because they benefit a handful of ultra-wealth people. I’ll take the broad prosperity, thank you. In the bigger picture I note that your request for proof of wealth transfer to the top as a result of tax reform is contrary to both presidential tax reform commissions in the last twenty years. By their own interpretation, they were specifically excluded by the Presidential Executive Orders creating the commissions from considering the wealth transfer effects of different tax reform. To my mind, this has been the most evil exercise of public policy during my lifetime. The tens of billions of dollars which Mr. Buffet and the beautiful people in the top 10% never report to the IRS as income is not considered as income in the CBO or the IRS numbers you cite. Family wealth numbers are also not considered. Equity would support a flat tax on net wealth to support all government services. After all, wealth is the only irrefutably fair measure of ability to pay. Let the top 10% pay 85.6%, the middle class pay 13.9% and the poorer half pay 0.05% of whatever tax revenue government needs. Today the middle class and poor (i.e. the 90%) pay a much higher percentage of various combined taxes than they can afford. •	Reduce the C corporation income tax rate so companies can pay more dividends but tax dividends at ordinary rates. •	Help workers and employers by replacing the job killing business portion of payroll taxes with a 4% VAT – (the lowest rate in the developed world). •	Limit the charitable tax deduction to charities that agree to provide transitional jobs in times of high unemployment. •	Tax individual income and wealth inversely by allowing those with less wealth to reduce their income tax rate (top rate of 28%, minimum 8%) by voluntarily paying a wealth tax (up to 2%). •	Exempt up to $500,000 (one million per family) in savings for retirement, health care or education. •	Allow lifetime wealth tax payments to offset an Estate Tax of 28%. Yup. I do think that. Because it’s true. According to a 2016 CBO report published by the Obama administration, the top 1% pay an effective federal income tax rate of 24%, compared to NEGATIVE 7% for the bottom quintile. How can that possibly be interpreted as the tax code helping the rich become richer? You bring up payroll taxes. Does that change the conclusion? The same CBO report shows effective tax rates for ALL federal taxes, income, payroll, corporate, and excise. Here, the top 1% pay 34% while the bottom pays 3%. So, no, the tax code does not create inequality. In fact, it reduces it a bit. Yes, inequality exists independent of the tax code. You’re jumbling all your tax and non-tax class-warfare rhetoric together. If you still think the tax code creates inequality, please educate us on how the tax code redistributes money from the poor to the rich. Provide some logic and details. The existence of inequality does not count as proof. So Mr. Wagner thinks the share of wealth has been shifted to the richest 10% in spite of, or independent of the tax code. Payroll taxes, sales taxes and perks only for the rich is a satire. Perhaps the food stamps and earned income credits and both adults working are proof of waste because they still borrow for education, autos and credit card expenses. They should be able to get ahead and save no matter the burden on their class. OMG! The tax code has redistributed wealth from the bottom 90% to the top 10%!! How is the tax code doing this dastardly deed? Is it like the Earned Income Tax Credit, but in reverse? So all the massive taxes paid by the bottom half are now being funneled to the rich via refundable tax credits? That’s outrageous! The deduction for state and local taxes is a modest 20% of the $1.3 trillion in tax expenditures (credits, deductions, special rates, deferrals, and exemptions). It has the singular advantage of preventing double taxation – an issue on Dan Mitchell’s bad list. I support eliminating all tax expenditures if the end result is the restoration of family wealth for the 90% that have suffered for over 30 years. The tax code has redistributed wealth to the top leaving 90% of the population with just 14.4% of individual wealth. The slice of the pie was 50% larger back in 1989. The downhill spiral continues in spite of Regan’s Tax Reform Act of 1986, the Taxpayer Relief Act of 1997 and all those credits which were intended to help the needy. The poorer half of the population now shares just a half of one percent of family wealth – (a share that was small, but still 180% larger back in 1989). The suffocation of the poorer half has caused a loss of hope and destruction of the family resulting in a 26% rate of marriage, 200 million STD’s with 20 million new cases each year, and unwanted pregnancies – (that will not result in adoption due to social stigma and economic concerns). There are real people behind all this tax code talk. Some politicians are too narrowminded to consider what a 4% VAT replacement of business payroll taxes could do for workers. There is nothing wrong with a C corporation income tax of even 8% as long as the increase in dividends are taxed at ordinary rates. The rich need to make do with a smaller share of a larger pie. Technically that’s not double/triple taxation because the *same* tax isn’t being imposed repeated on a single dollar of income. The classic double-tax is the corporate income tax. Imagine you own a business solely or as a partner, and it’s set up as a pass-through entity, meaning it’s income flows directly to your personal tax return (or is shared with your partners). One level of (income) tax. Now imagine the exact same business is set up as a corporation with shares given out to all the owners. You pay the corporate income tax on any profits – and then, if the money is distributed as dividends, you pay again as individuals! In the bad old days that would have meant hitting $1 of income with a 35% tax, then hitting the 65 cents with another 35% tax, leaving you with 42 cents. Now *that’s* a double tax. Our tax system very imperfectly tries to fix this problem by offering a lower tax rate on dividends (and capital gains). If coupled with a lower corporate tax rate, you could make it come out about even, but it’s complex and leaves a lot of potential loopholes to be exploited. But, as an example, suppose the corporate rate was 20% and the dividend rate was also 20%, then that $1 of income becomes 80 cents and then 64 cents, almost exactly the same as the single-level 35% rate. It would be simpler to just have one individual rate and make the corporate rate 0%, but it’s hard to prevent wealthy people from setting up personal corporations to postpone their tax liability indefinitely. Dan makes a similar argument for capital gains, though here I would say it depends on whether the gains are due to the company retaining income that has been taxed, versus actual gains in the value of the business. The latter would, in my opinion, be additional income that has not been taxed. In other words, I think Dan has a blind spot here. It’s easiest to see this blind spot by considering a simpler case. You buy a house as a rental property, and pay income tax on the rental income for years. During this time, the house goes up in value. You sell it. The income you get from the capital gain on the house has not been previously taxed. So, IMO, imposing a capital gains tax on this is not double taxation. I would certainly agree that it’s not all “real” income either – a lot of the “gain” is actually just inflation from the government debasing our money. So if you wanted to be fair in taxing this income, you’d have to allow the owner to adjust the cost basis (the purchase price) upward for inflation, thus reducing the gain to just the real income it represents. 1) A deduction for state/local taxes seems to eliminate a form of double taxation. If my income is $100k, I pay payroll taxes on $100k, fed income tax on $100k, and state/local income tax on $100k. That’s triple taxation of the same dollars that I never have at my disposal. 2) Isn’t there already a cap on itemized deductions? A cap would have similar effect as elimination, in terms of federal revenue considerations, and perhaps easier to enact or increase. Rich taxpayers use the mortgage deduction to crowd out less wealthy citizens from the real estate market, and make housing more expensive, more exclusive. But the distortion does not stop there. As soon as rich taxpayers secure their exclusive house, they start frequenting their “community” webpages, grab pitchfork and green flag, and head out to city hall every time something new is to be built. Especially if some fellow across the hill (read view) wants to build houses afforded by ordinary middle income people. In an act of suicide, the naive middle class lemmings, awakened by rich folk city hall activism, go and buy “save the hills” stickers for their bumpers. I forgot,… ….who coined the term “useful idiots”? These “reforms” are a joke. What is acceptable now will be a bad joke in 10 years. Do we expect these larger exemptions to increase year after year? Just like they increased the deductions for dependents. But you know your state income and property taxes will continue increasing. Just put in a 10% flat tax, no deductions. Start it after the first 30,000 in income. Also stop taxing social security benefits. I love the monster-movie simile. It’s just too bad Trump doesn’t wield a big enough flamethrower to avoid the need for two or three more sequels. Where’s Godzilla when we need him?